"This name later embraced all of what is now the United States," -- the key point of all my columns on the quincentennial is written on the wall in St. Augustine. My reservations are made; my plans are solid. I'm going to be in Florida on April 2 and 3 to celebrate the 500th anniversary of Juan Ponce de Leon's great discovery. But it's not really fair. I'm going to a celebration that should be coming to me — and to all of us across this country! When Florida marks its quincentennial, the whole nation should be celebrating its 500th birthday. 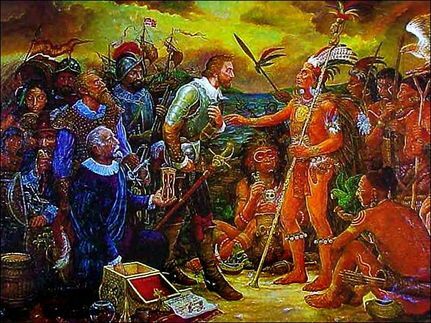 After all, on April 2 and 3, 1513, Ponce de Leon didn't just discover and land on what today we know as the State of Florida but on the mainland that later became the United States. Although Florida initially was believed to be an island, in the late 16th century, European scholars and mapmakers used the word "Florida" to describe much of the territory now known as the U.S. mainland. Yet nowadays, when we hear that Ponce de Leon discovered Florida, we give him credit only for one state. It's absurd! But why would we deprive ourselves from celebrating our 500th birthday? Why aren't we planning a huge, nationwide series of events to commemorate our quincentennial in April? Why are we letting Florida have all the fun? And why is the rest of the country oblivious to the upcoming Florida celebrations? Could it be simple confusion about the territory Ponce de Leon discovered? Could it be small-minded planning by Florida officials who failed call for a national celebration? Could it be greed for tourism dollars that made them reluctant to share their party with the rest of the nation? Or could it be "The Black Legend," that insidious centuries-old campaign that keeps minimizing the accomplishments of the Spanish explorers and their Latino descendants? Had this country been discovered by Anglo-Saxon explorers, instead of Spanish conquistadors, wouldn't we be getting ready for fireworks all over the United States? The answer is: Yes, all of the above. In 1976, we had a great national celebration to commemorate the bicentennial of our Declaration of Independence. There were many wonderful events to help Americans reconnect with their history. Doesn't the quincentennial of our discovery deserve similar national attention? 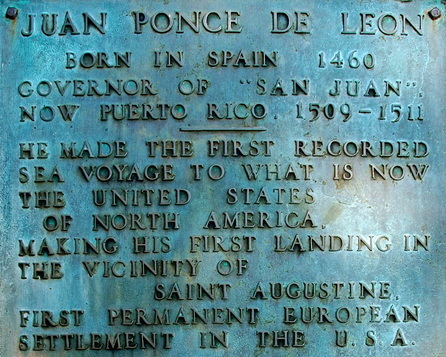 Wouldn't it give Americans another wonderful opportunity to reconnect with yet another portion our history, especially the history of Ponce de Leon and the millions of other Hispanics who have been following him to North America since 1513? So why neglect our "American Discovery Day"? Is it because it recognizes the Hispanic roots that American history tends to keep hidden? Is it because it reminds us of nearly a century of Spanish exploration of North America before the British arrived? 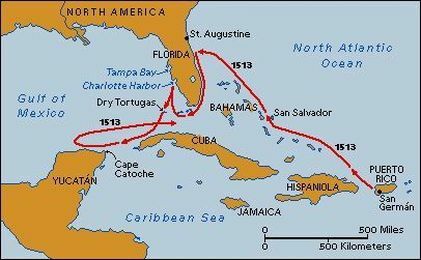 Mind you, in 2004, the two U.S. senators from Florida, Bob Graham and Bill Nelson, both Democrats, introduced federal legislation that would have established a "National Commission on the Quincentennial of the discovery of Florida by Ponce de Leon" to "encourage, coordinate and conduct" celebrations that would "enhance public understanding of the impact of the discovery of Florida on the history of the United States." Although it was passed by the U.S. Senate, the bill never cleared the House and never became law. And so plans for a national celebration never went anywhere. Yet now that so many politicians acknowledge their need to reach out to Latinos, one would think they would grab this opportunity to begin recognizing 500 years of hidden Hispanic heritage. This is the time to recognize the great feats of those conquistadors who discovered, explored and settled huge portions of North America long before other Europeans. 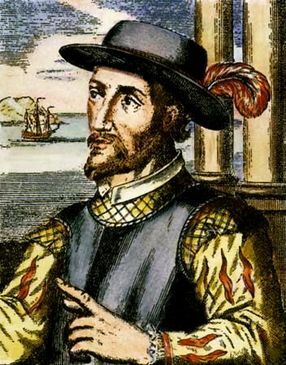 Ponce de Leon arrived in the New World on Columbus' second voyage, became the governor of Puerto Rico, and then led the 200 Spanish sailors who were the first Europeans to set foot on the mainland that later became the United States. This is the time when all Americans should be learning more about them. Nevertheless, this is only happening in Florida, where a year-long series of cultural and heritage events already are underway. Under the statewide "Viva Florida 500" campaign, there will be history lectures, art exhibits, tall ship flotillas, parades, fireworks and wonderful reenactments of historic moments. But unfortunately, these events are so small and so local that the rest of us are not even aware of them. If you follow news accounts on plans for the Florida celebrations, you know that instead of trying involve the rest of the nation, two towns are currently competing for the right to claim the site where Ponce de Leon first landed. First you have St. Augustine, founded in 1565, remaining the oldest permanent settlement in the United States, but also always claiming to be the site of Ponce de Leon's first landing in 1513. On April 3, the city is planning a ceremonial replica-ship reenactment of the landing at the downtown bay front, a mass at Cathedral Basilica of St. Augustine, the erection of its fourth Ponce de Leon statue and the dedication of a reproduction baptismal font on which Ponce de Leon was baptized in 1474. I plan to be there. And then you have Melbourne Beach, some 142 miles to the south, where community activists and history buffs have been on a decade-long campaign to prove they live much closer to the real landing site. 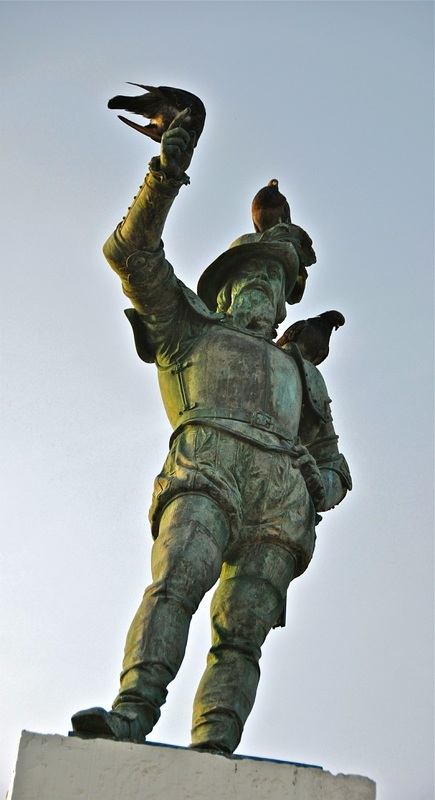 On April 2, Melbourne Beach will host its own replica-ship landing reenactment, an Air Force fly over, a Naval 21-gun salute and the unveiling of a 10-foot bronze Ponce de Leon statue in the city's "Don Juan Ponce de Leon Landing Park." I plan to be there, too. 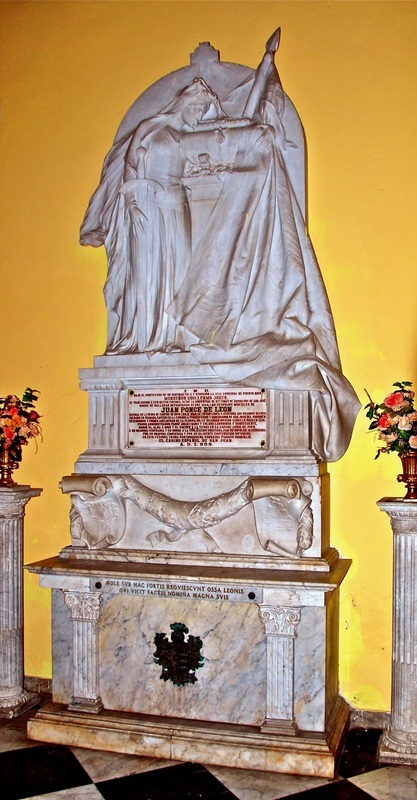 For other columns that are part of my series in search of America's hidden Hispanic heritage, I've already reported from Ponce de Leon's old house in Santo Domingo and from his gravesite in Old San Juan. But for the reenactment of his disputed landfall, I'll be driving all over Florida — not only to report to other Americans on the birthday party they will be missing, but to showcase the Hispanic heritage that will be uprooted there and yet remain hidden from the rest of the nation.